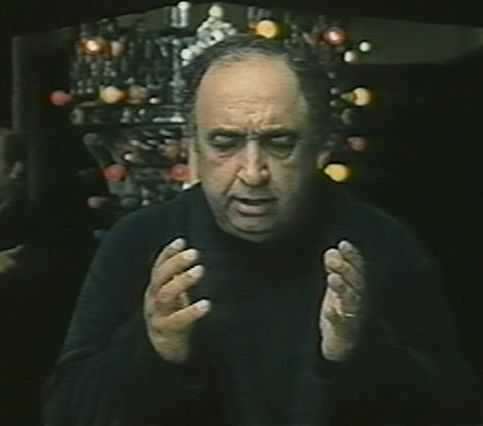 Smell of Camphor, Scent of Jasmine (Booye Kafoor, Atre Yas, 2000) is Iranian writer-director Bahman Farmanarai’s mordant rumination on death and what it means. The film’s story concerns an ageing Iranian filmmaker who, like Farmanarai, himself, has been unable for more than twenty years, since the 1979 revolution, to get permission from the rigid government censorship authorities to make a film. 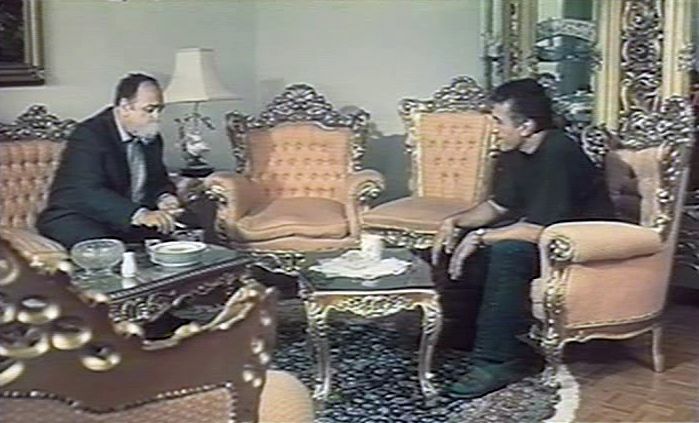 He is shown finally getting permission to make a documentary for Japanese television about Iranian burial rituals, and this film recounts his activities on that project. This directly parallels Farmanarai’s own situation, since Smell of Camphor, Scent of Jasmine was the first film he was allowed to make since 1978. In a way this authorization that he received is somewhat surprising in view of the film’s consideration of the contentious issue of artistic freedom in Iran [1,2]. Given the film’s reflective, semi-autobiographical nature (Farmanarai, in fact, plays the lead role in this story), it may remind some viewers of Fellini’s 8½ (1963), but this film differs from similar introspections by maintaining its focus throughout on death in its various connotations on both the personal and social levels. Anyway, the idea of our own death is often in the background of many of our innermost personal reflections, and as philosopher Martin Heidegger pointed out, “being-toward death” (“Sein-zum-Tode”) is a way of being that orients us to our most authentic selves [3,4,5]. It is up to the viewer to decide whether this assertion holds true in Smell of Camphor, Scent of Jasmine. The film narrative is partitioned into three loosely structured acts as they progress towards a more philosophical compass. Linking these acts is an outer metaphorical narrative level showing the main character sitting in a train car and looking contemplatively out the window as if he is being taken on a journey to who knows where. Along the way, there are various attitudes towards death presented, which I will identify below by the token “AtD”. This act begins with filmmaker Bahman Farjami (played by the film’s author, Bahman Farmanarai) planning to visit his deceased wife Jaleh’s grave on the fifth anniversary of her funeral. One of the perspectives towards death that apparently comes to our protagonist’s introspective mind is that of traditional Islamic burial rituals (AtD1). This is depicted at multiple points in the film by showing a dour mullah looking straight into the camera and formally reading texts prescribing Islamic burial rites. Afterwards Bahman still has to deal with the corpse in his backseat and wants to avoid trouble, so he goes to visit his lawyer, Dr. Arsteh (Reza Kianian, who has also played in The Wind Carpet (Kaze no Jûtan, 2003), The Fish Fall in Love (Mahiha Ashegh Mishavand, 2006), The Maritime Silk Road (2011), and A Cube of Sugar (Ye Habe Ghand aka One Cube of Sugar, 2011)) to see what he can do. Arsteh cynically tells him that he has “connections” for dealing with this kind of thing and that they should avoid official procedures (AtD5). Afterwards, his bossy sister drops by and scolds him for continually mourning the loss of his wife and not moving on with his life. She tells him, in fact, that he should start a new life (AtD7). But Bahman rejects all such gloomy and “practical” advice and goes ahead with his usual self-indulging habits. Instead his investigations about death rituals set him off to imagining his own upcoming death, and now it is if he is working on a film for his own death. He visits a hejlehs (burial lights) vendor and a termeh (traditional woven cloth to cover a corpse) vendor and imagines how these might be used in connection with his own burial. He also visits some of his own old actor friends and lines them up to appear in the documentary he is making. At his film editing studio, Bahman looks at some stock footage his assistant his found for him to be used in his documentary that show crowds of people mournfully engaged in self-flagellation. He scolds his assistant for providing him with footage that is only appropriate for mourning dead saints, not for dead artists. 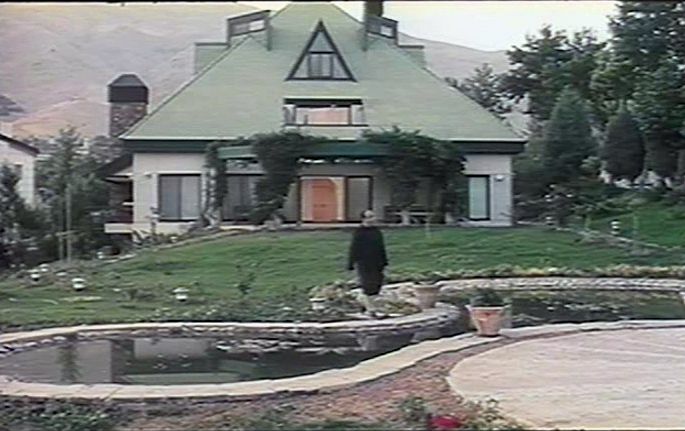 This signals to the viewer that Bahman has switched his intentions from making a film covering the wider compass of Iranian death rituals to making a film about the death of an artist, i.e. himself. Later Bahman scans through some of his old photographs of himself and discusses with his family servant which ones would be appropriate for display at his funeral and in his obituary. But his servant dismisses his concerns, reminding him that once you are dead, you are gone, and these things don’t matter (AtD8). Then Bahman goes to visit his Alzheimer’s-stricken mother, who no longer recognizes him. He laments the fact that since our sense of our own identities is essentially based on our remembered narratives, her condition is already “death before dying” (AtD9). Hoping to trigger something hidden in her memory, he begins reading to his mother Edgar Allen Poe’s macabre short story “Silence - a Fable” . I can’t imagine why Bahman would choose to read that particular story to his mother, but Farmanarai’s reference to it here is telling, because Poe’s story chillingly invokes the deathly horror of silence. 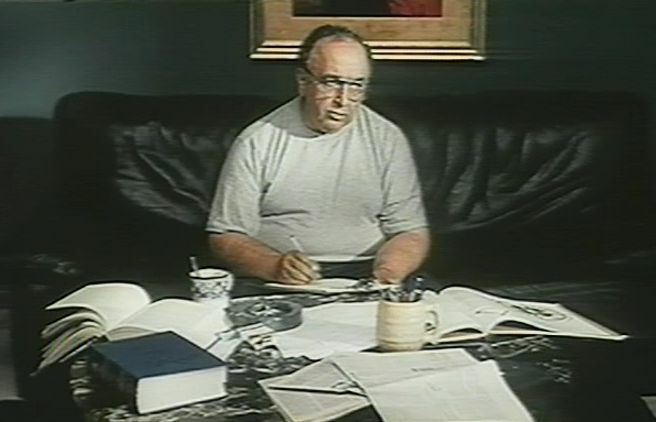 Bahman goes home to work on his film script, which we can has now become a recounting of his own recent experiences, when he gets a phone call from his writer friend’s wife. She informs him that her husband committed suicide, and this news seems to trigger another heart attack for Bahman. While unconscious in the hospital, Bahman has dreamy visions not of people but of scenes from nature. Afterwards he informs his old actor friend that he no longer wants to make the film he has been working on. “We have forgotten the meaning of life”, Bahman tells his friend, and he says that he now just wants to somehow return to that youthful feeling for the wonder of nature. Bahman, asleep in bed, has another dream of his wife Jaleh walking in her burial shroud (he had an earlier such vision at the film’s outset). Then he goes outside to his backyard and suffers another heart attack. While swooning from the attack, he has a nightmare of his own funeral being filmed in his home. This sequence is the most creative and surreal part of the film. In the dream Bahman is distressed to see that the shooting crew are not following his original instructions for his own funeral, nor are they filming it according to his plans. He tries to intervene in these scenes, but noone can see him or is aware of his presence. Finally, he screams out, “Cut!”, and he wakes up from his nightmare. He now gets a phone call from his son Nima, who informs him that his wife has just given birth to a baby girl, whom they have named “Jaleh”. 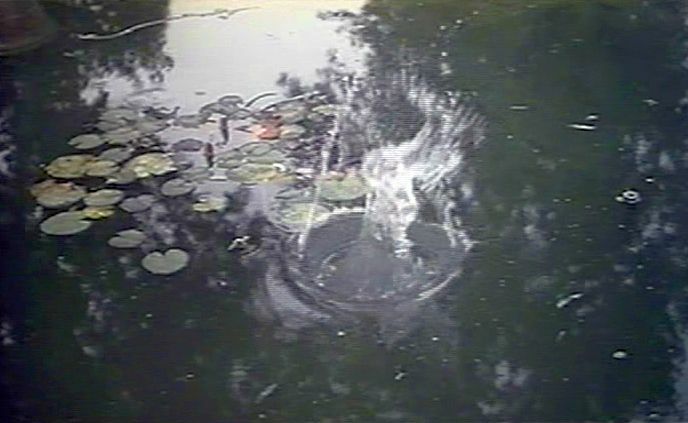 Then Bahman goes out in his backyard again and walks over to the small water pond there. He picks up a pebble and tosses it in the water. The final shot shows the circular waves spreading out in the water from where the tossed pebble landed. Smell of Camphor, Scent of Jasmine’s meandering depiction is more like a set of personal reflections than a clear-cut narrative account. There are a number of traditional attitudes towards death (AtDs) presented, but none of them are satisfactory to Bahman or to us. 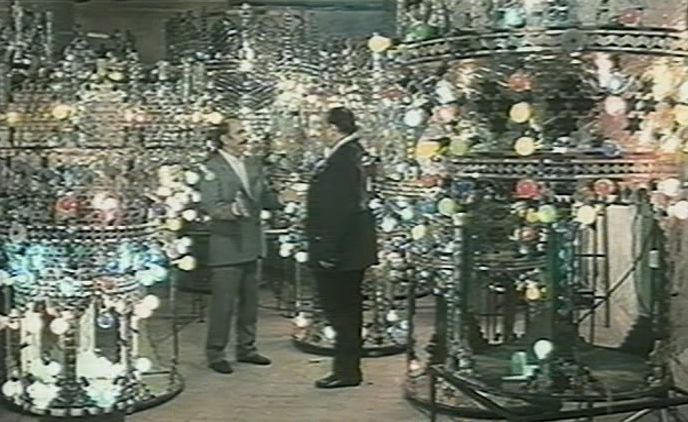 Instead of arriving at the sought-after closure about death, the film and Bahman end up closing on openness. With the focus on Bahman’s mundane, portly figure (which may remind some viewers of Alfred Hitchcock), the story is conventionally filmed. Bahman Farjami comes across as a relatively passive, but dissatisfied, protagonist riding along on his long existential train ride to nowhere. In this sense the evocation of his subjective anguish is only equivocal. Admittedly, some feeling for his existential isolation is indeed emphasized by a number of long tracking shots showing him walking about in the cemetery or in hospital corridors. The dynamism of the cinematography shifts, though, when we get to the nightmare funeral-filming scene in Act Three. Here the view falls into an almost subjective frenzy, with several 360-degree pan shots, one of which is an accelerating multi-circular pan precipitating Bahman’s desperate calling out of “Cut!”. 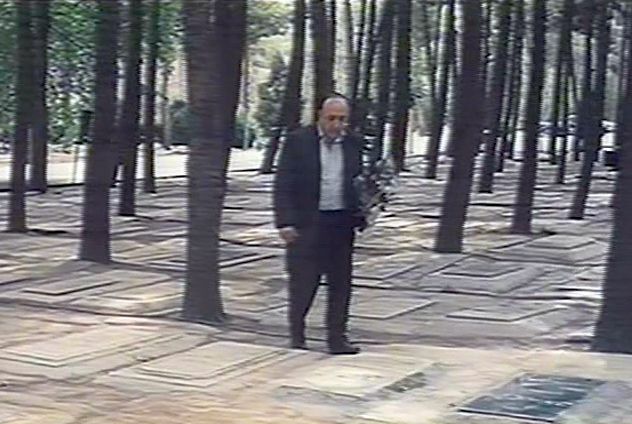 One is tempted to compare Smell of Camphor, Scent of Jasmine to Abbas Kiarostami’s prize-winning Taste of Cherry (Ta'am-e-Gilas, 1997), which is also about death. But to me the two films have quite different feels to them, and Farmanarai’s Smell of Camphor, Scent of Jasmine is the superior work. Some people have considered Farmanarai’s film to be a comedy, but I don’t see it that way. There are indeed moments of irony, but the overriding topic is deadly serious. Though the film has its limitations, I feel that it does offer an interesting coverage of a challenging theme. 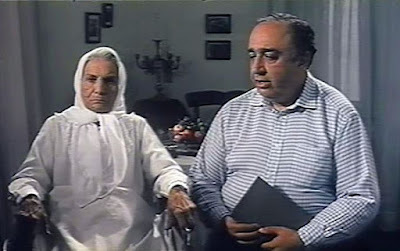 Flora Roberts and Ed Hayes, “Between life and death: two Iranian films”, openDemocracy, (31 January 2002). Acquarello, “Smell of Camphor, Frgrance of Jasmine, 2000", Strictly Film School, (2003). “Being-toward-death”, “Heideggerian terminology”, Wikipedia, (22 January 2018). Martin Heidegger, Being and Time (1927), translated by John Macquarrie and Edward Robinson, Harper & Row, (1962). The Film Sufi, “‘Wild Strawberries’ - Ingmar Bergman (1957)”, The Film Sufi, (11 August 2016). Edgar Allan Poe, “Silence - a Fable”, (1837), EDGAR ALLAN POE: Tales, Sketches and Selected Criticism, The University of Virginia.